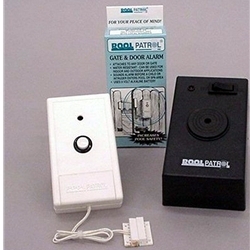 The Pool Patrol Gate & Door Alarm is a wireless door/gate monitor that detects entry into your pool or spa area. It is equipped with a reset button to allow a six second pass through without sounding the alarm. The alarm comes complete with all the necessary mounting hardware for installation. An alarm will sound both at your gate/door and in your house up to a distance of approximately 200 feet. The remote receiver has an on/off switch with an "on" indicator light and is powered by a 120 volt A.C. wall transformer. Gate Alarm is Battery powered and uses one 9 volt alkaline battery (battery not included). Custom outdoor additional passthrough buttons or Remote Receivers are also available for special order (contact us for details). Note that special orders may take 5 to 10 business days to ship.